The SafetyRig™ is a gravity-fed portable safety shower and eyewash. In addition to providing compliant (ANSI Z358.1 2014) safety shower and eyewash treatment, it also provides accident victims with much-needed privacy and protection from harsh weather elements. The SafetyRig has the built-in capability of containing shower and eyewash wastewater. This rugged new design is built for the most demanding users, locations, and environments. For years the quality and functionality of mobile safety showers has lagged significantly behind market needs—until now. Beginning with a blank slate, ATS ShieldSafe collaborated with top engineers to redefine mobile safety showers. Those efforts produced the SafetyRig’s one-of-a-kind gravity-fed design that allows for continuous operation without power or pneumatic backup. The SafetyRig protects accident victims from harsh external weather conditions inside a heated (cooled, optional) mobile shelter. Its unique self-contained design eliminates the need for ANSI-required weekly activation tests. Instead, all that is required is a simple weekly visual verification of water level. 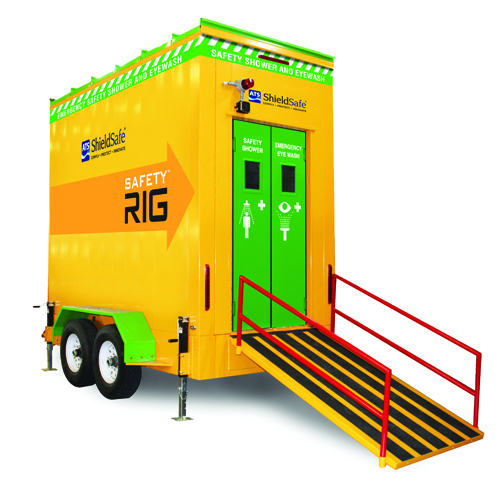 Only the SafetyRig™ includes wastewater containment within the frame of the trailer (below the shower) to protect your work area from dangerous and inconvenient cleanups. It can also be outfitted for use in explosive environments as well as hot and cold climates. 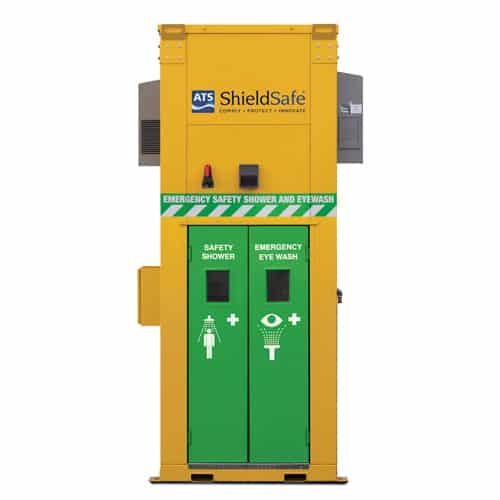 The ATS ShieldSafe SafetyRig: a durable, enclosed portable safety shower that offers long-term value and complete safety to your employees and company. See the features and available options for the SafetyRig.